This is one of the first paleo “desserts” that I ever made. V loves it and it’s pretty much a staple dessert in our house. 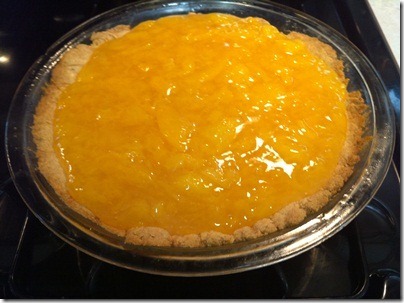 Note that you can use whatever fruit you wish, but I most commonly use peaches. 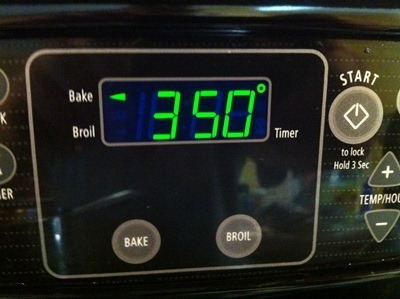 1) Pre-heat oven to 350F. 2) Get 1.5c of almond meal/flour and put it in a bowl. 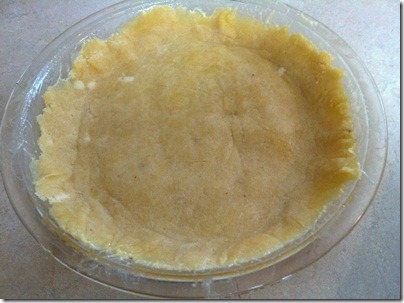 3) Get some finger-fulls of butter and grease up your pie plate. 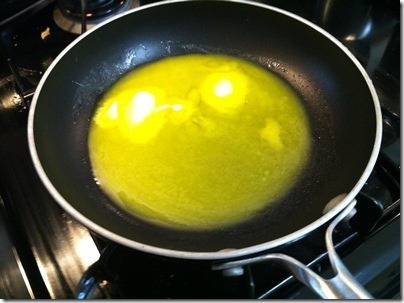 4) Melt the 3 Tbs of butter however you wish. 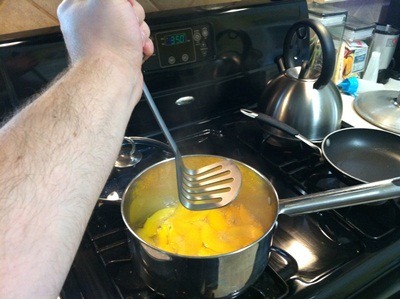 I really don’t care how you do it. 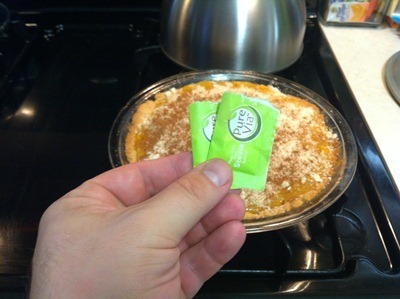 Just melt it. 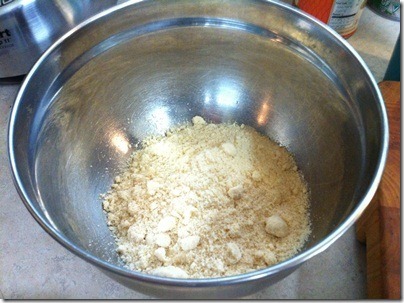 5) Pour the butter over the almond flour and mix until it looks like wet sand. 6) Dump the wet sand mixture into the pie plate and shake it back and forth to even it out. 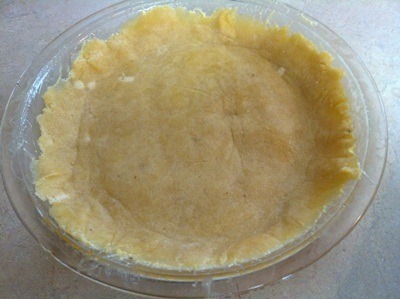 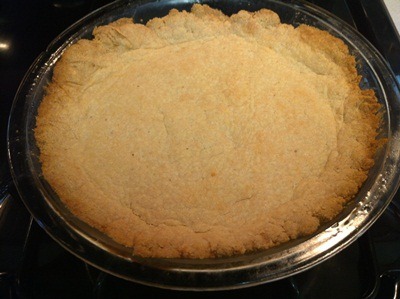 7) Place your parchment or wax paper over the mixture and press it into the pie plate. 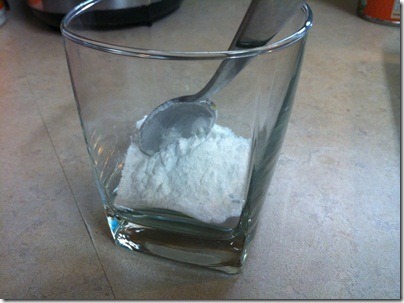 I sometimes use the bottom of a measuring cup or drinking glass for this as well. 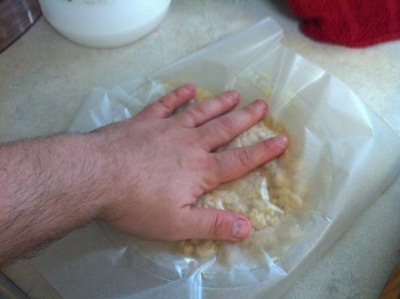 8) Remove the parchment. Easy! 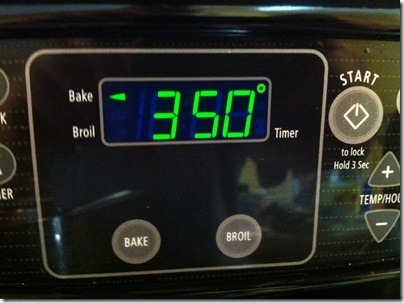 10) Put that sucker in the oven for 15-20 minutes, or until it looks like this. 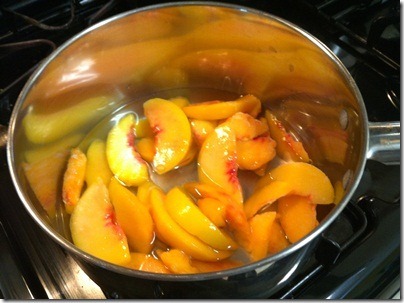 11) While your crust is cooking away, get your 2c of peaches + 0.5c water going over medium heat. Cover and cook for about 15 minutes or until the peaches fall apart. 12) Once the peaches are falling apart, MASH! 13) Add 4 packets of stevia and stir. 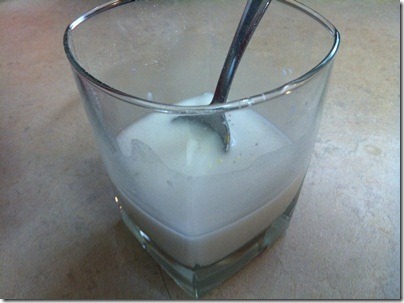 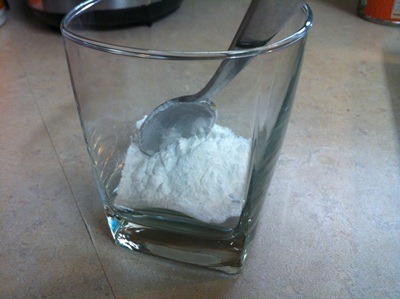 14) Put your 2 Tbs of arrowroot powder into a glass. 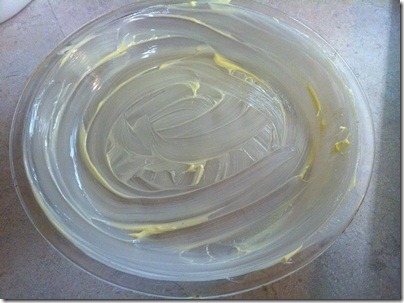 15) Add some water (about 0.25c maybe?) 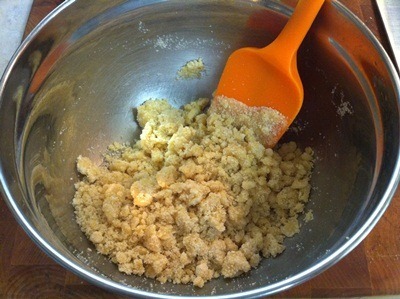 and mix. 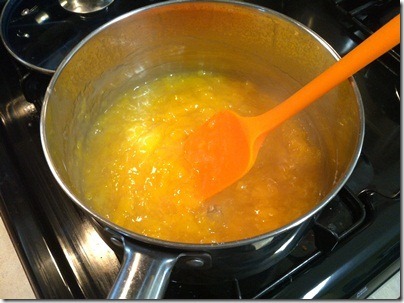 16) Turn your heat to low and add the arrowroot slurry to the pot. 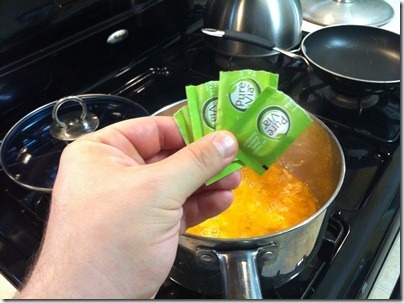 Mix it in and let it cook away for a minute or two. 17) Pour the mixture into the shell. You might have some left over. 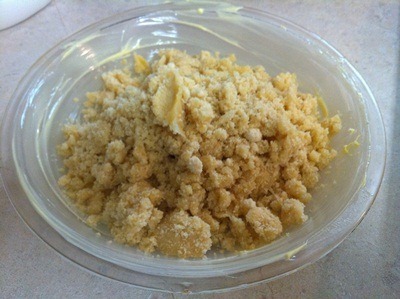 18) Bonus topping time! 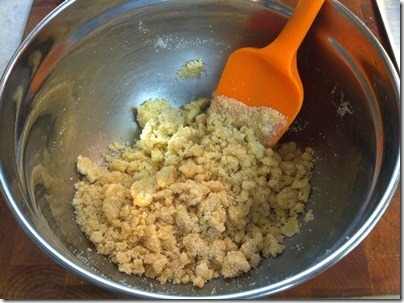 Sprinkle on a light layer of almond flour followed by 2 more stevia packets and a light dusting of cinnamon. 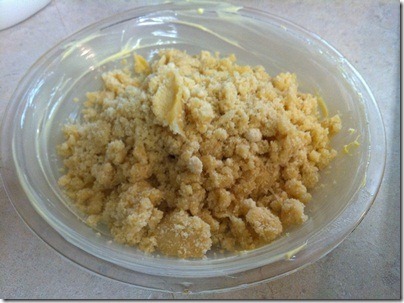 19) Add pats of butter all around. 20) Put it back in the oven and cook for another 15-20 minutes. 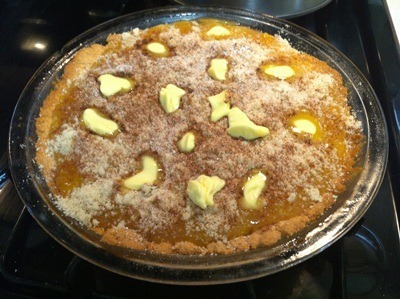 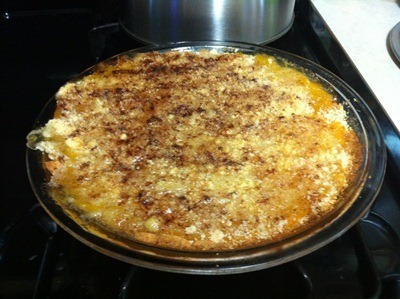 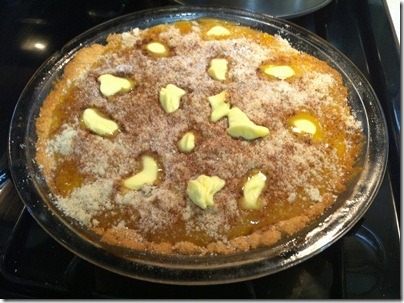 This entry was posted in Uncategorized and tagged Peach Cobbler, Recipe on December 5, 2011 by bgoldstein.